The Rogue Valley Chorale is Southern Oregon’s oldest public choral organization. 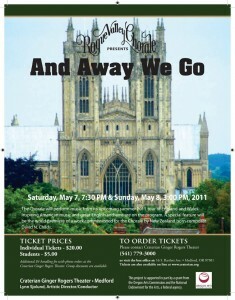 It was founded in 1973 by a group of local musicians who were eager to provide a forum for performing fine choral music. After initial discussions regarding requirements for membership, programming and other considerations, Lynn E. Sjolund, then director of vocal music at Medford Senior High School, agreed to direct the chorus. Articles of incorporation were filed and non-profit status was acquired with five members serving as the first Board of Directors. Auditions were held and forty-five singers presented the premier concert of the Rogue Valley Chorale on December 4, 1973. On the program were Bach’s Komm, Jesu komm and Respighi’s Laud to the Nativity. The Chorale Organization has grown in number and musical stature in the past four decades and now includes five choruses and over 300 singers comprised of both youth and adults. The group has conducted multiple European tours and performed in Salzburg, Austria for Mozart’s 250th birthday celebration. 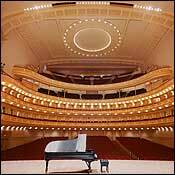 The Chorale had the distinct honor of performing as the featured group at Carnegie Hall in a concert conducted by John Rutter. To learn more about the Rogue Valley Chorale click on a season below. In June of 1993 Commemorating the three-hundredth anniversary of the birth of J. S. Bach, the Chorale performed his masterpiece, the Mass in B minor. The performance featured nationally recognized soloists. The principal orchestra players were the University of Oregon String Quartet. The Chorale performed the work again fourteen years later. In June of 1993, the Chorale visited Veszprem, Hungary to take part in the American-Magyar Cultural Festival. It was a privilege to perform Zoltan Kodaly’s, Te Deum in the composer’s native country. Chorale members were intermixed with Hungarians in the massed choir accompanied by the Budapest Symphony. Chosen to sing the difficult soprano solos was the Chorale’s own Susan Olson. The old saying that “music is the universal language” is applicable here. A quote from the local Veszprem newspaper The Naplo reads, “Borders and national differences were washed away. . . . Our American guests have produced the best concert of their lives.” The Composer Bela Halmos traveled across Hungary to hear the Chorale perform his music. The Chorale toured Sweden and Norway during the summer of 1995. At Santa Clara Kyrka in downtown Stockholm, the Chorale sang as a visiting choir taking part in the Sommarkonserta (summer concerts). The Chorale performed concerts in Ostersund, Trondheim, Bergen and Oslo. In Oslo the concert was attended by the distinguished composer Knut Nystedt. Italy was the destination for the Rogue Valley Chorale’s third European concert tour. A total of six formal concerts were sung in Italy and a number of impromptu concerts given as well. The Chorale presented a varied repertoire that included music composed for Italian churches, anthems from other countries, twentieth century anthems, folk songs and spirituals. It was a wonderful experience to sing these selections in the magnificent cathedrals of Venice, Florence and Pisa. The Chorale collaborated with a local choir from Alba, Medford’s sister city, for an evening concert. It was presented in their Civic Theater, the counterpart of our Ginger Rogers Craterian Theater. They also participated in an inspirational Mass in the Cathedral of Alba where the priest spoke of the universal bonding though music. With trips on the Rhine and Mosel River, the Chorale celebrated its 30th anniversary singing in Germany, Belgium and The Netherlands. Highlights of the trip included special performances in Koblenz, Brugge and Utrecht. Invited to participate in the 250th anniversary of the birth of Mozart, the Chorale traveled to Switzerland, Germany and Austria. With special concerts in Luzerne and Bern the Chorale prepared for rehearsals in Salzburg. Performances of Mozart’s Coronation Mass and motets by American composers were held in the Salzburg Cathedral where Mozart had been the organist choir director. Concerts were under the direction of Eph Ely and conducted by Janos Czifra. The festival moved from Salzburg to Vienna to be repeated. 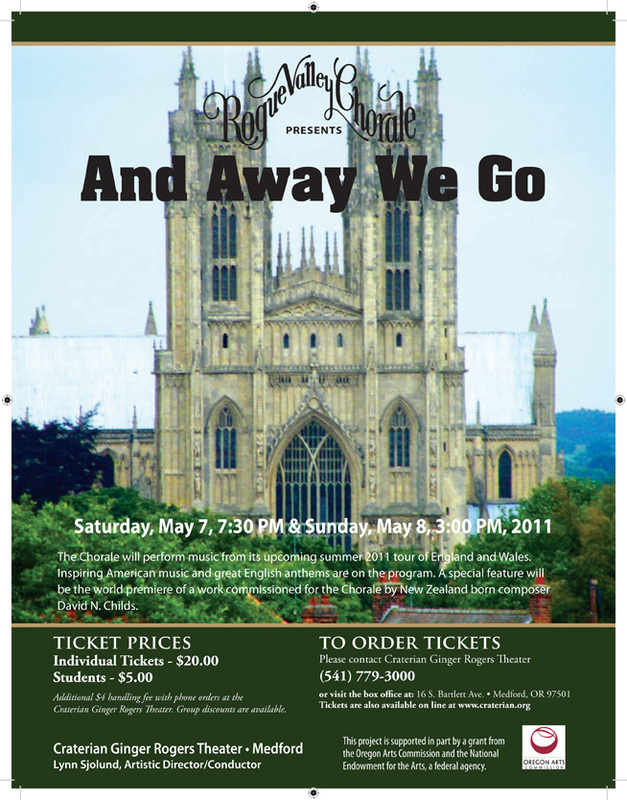 The Chorale traveled to England and Wales during the summer of 2011, performing in major cathedrals and venues throughout the isle. The following is a representative selection of music performed by the Rogue Valley Chorale. 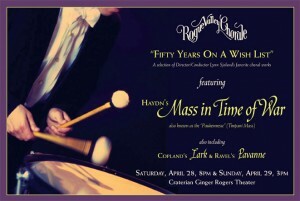 In addition to the above classics the Rogue Valley Chorale has performed many Broadway songs, anthems, spirituals and ballads from myriad time periods. Composers include Aaron Copland, Dr. David Childs, Simon and Garfunkle, The Beatles, Leonard Bernstein, George Gershwin, Cole Porter, Frank Loesser and many more.